Beat Ghana, check. Tie or beat Portugal, check. Stand up to Germany, check. Team USA did what was necessary to get out of the group. Now comes the real test. A real "final," so to speak, for the USMNT: Belgium. The truth is that Klinsmann trained his crew for the group stage. They had to earn points against the best African side in the world. No offense to Nigeria or Algeria, but the change-up, positioning and speed of play is much better for Ghana. USA also nearly defeated a wounded Portugal and might even have tied Germany. Landon Donovan put it well when he was asked about the exceptionalism of this USMNT. Sometimes things just go right, he insisted. You score in injury time (vs Algeria in 2010), you advance out of group stage by virtue of other scores (2002, 2014). The "breakthrough" in 2002 was defeating heavily-favored Portugal. The match against Mexico was icing on the cake. Germany in the 2002 quarterfinals was just that: Germany. Tomorrow's test is completely different. USA was handed one of the more unpredictable and difficult sides in this World Cup when they finished second in the "group of death." 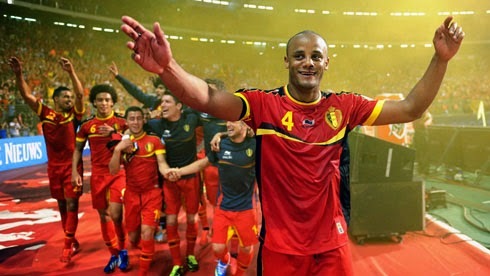 This Belgian squad has the likes of Hazard, Kompany, Lukaku, Dembele, Fellaini, Mirallas, Courtois, Januzaj, Vermaelen. If they sound familiar it's because you know soccer and you know the teams they play for. Top teams like Chelsea, Manchester United, Everton. But Belgium is also very young, with its 11 starters averaging less than 25 years old. Also, only one player has participated in a World Cup. For USA, we have Bradley, Dempsey, Howard and Beasley from the starting lineup that know how it works. Even so, Belgium was ranked in the top right and that is why they got to be a top-seeded team and were given a "group of life," of sorts, along with Russia, Algeria and South Korea. They are one of the "top" European teams still in contention and they are better than others like Greece or Switzerland. This is why Team USA could take the true "next step" by earning a place in the quarterfinals against a true contender, regardless of how lackluster the Belgians' performance has been so far. Is it a bridge too far? Most of us thought the group stage was and they proved us wrong.